I understand austerity is self defeating and crippling, but is there any other way to constrain elected officials from driving into unsustainable public debt as they pander for votes and campaign support?………or must we just go through periodic sovereign debt bubbles? and i understand austerity protects the bondholders at the expense of the people [the electorate], but afterall it is the people that collectively elect the officials that run up this debt. ANSWER: Socialism has been the bribing of the population representing the worst side of democracy – the denial of equal protection of the law based upon wealth. Earn more than someone else and you are evil; they cheer politicians who say they will legally rob the rich, and will legally give it to you. This is no different than racism or denying equal protection to any group based upon gender, creed, ethnicity, or association of some kind. So yes, the people voted for politicians based upon greed and bribery. Socialism even violates the Ten Commandments: “thou shalt not covet thy neighbor’s goods” (Exodus 20:17). How can you pretend to go to church on Sunday and then justify robbing others under the cloak of good intentions called SOCIALISM? The only way to prevent this type of system was to adopt what the Founding Fathers did in the USA – two-year terms for Congress – because there was no pay and they met only for a few weeks each year. That was closer to a citizen government. The mistake was this should have been hard-coded into the Constitution for once they tasted power they began to pay themselves, becoming career politicians. Jefferson agreed to Hamilton’s proposal of a national debt, provided it was paid-off. This was actually accomplished, as illustrated above. You can see there was no national debt and there was no direct taxation (Income Tax) until 1913. To solve the problem, there should be NO career politicians and the government should be barred from borrowing money. Those are the key issues. Claiming to make a gold standard or some other nonsense to make “sound” money is pointless. You cannot create sound money with taxes and borrowing intact. 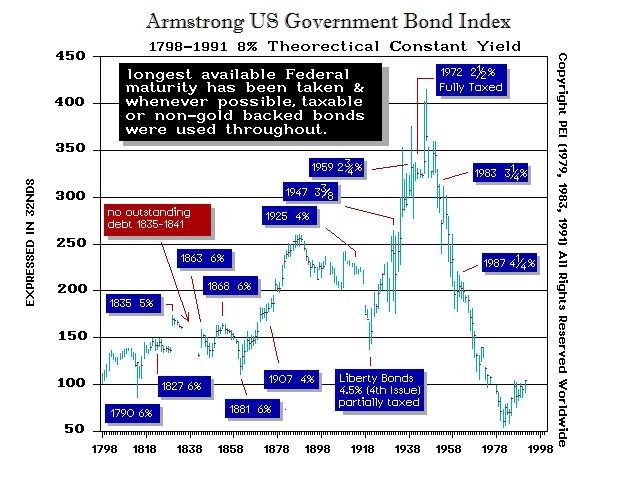 We had a gold standard and that failed because politicians borrowed and spent more than there was when gold was fixed at $35. Therefore, a gold standard will always flop because you are trying to use that as a restraint upon government. Deal with the problem directly, for indirect means will never succeed. « How Much Cash Should One Have Outside of the Banks?